UTA and city officials opened the new Career Development Center in the E.H. Hereford University Center. Watch the video and see photos from the event. Lolín Martins-Crane (’88 BS, Psychology), wearing red, is the center's director. Learn more about Crane. Welcome to the new TrailBlazer, UTA’s e-newsletter for students. The streamlined, efficient design directs readers to the full story for news; to websites for alerts, training, and sports; and to the new events calendar for details on lectures, exhibits, entertainment, and other happenings. You can find TrailBlazer in your UTA email inbox every Tuesday during the fall and spring semesters and every other Tuesday in the summer, except for campus holidays. Delivery of TrailBlazer was delayed because of computer and network issues related to a malware attack aimed at UTA email accounts. Learn how to protect your computer and other devices from malware and other online threats at uta.edu/security/phishing. Preferred seating, VIP packages, and season tickets are available for the Maverick Speakers Series. 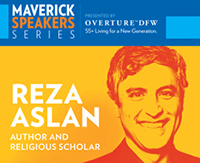 Author and religious scholar Reza Aslan kicks off the 2016-17 series at 7 p.m. Tuesday, Sept. 13, at Texas Hall. The lecture is free for faculty, staff, and students and costs $5 for public general admission. The VIP package includes an exclusive reception with the featured speaker along with entry to a private sit-down, catered dinner before the event. Also included are photograph and autograph opportunities. VIP tickets are $500 per person for each event $400 of which is a tax-deductible contribution to the President’s Fund for Excellence at UTA. If you have questions about the VIP Package, please contact Mark LaVelle at mlavelle@uta.edu or 817-272-5325. LEARN MORE. UTA students should be cautious of phone scams in which the callers identify themselves as members of UTA or a governmental agency, then threaten to arrest them on false or fictitious charges if immediate payment is not made to the suspects via a money card. The calls are from individuals posing as representatives of local law enforcement agencies, state agencies, the Internal Revenue Service (IRS), other federal agencies, and even UTA. Some calls target international students. The telephone number used may be a cloned number from a legitimate agency or University office. Parking permits are available now for students for the 2016-17 year, including permits for the academic year, one semester, monthly, and weekly, and the Maverick Parking Garage. Read more about parking options. Park and Ride—only $90—allows students to park at Maverick Stadium (Lot 25) or the intramural fields complex (Lot 26) and ride a shuttle bus to class. The buses takes students to the Business Building in about 12-15 minutes and the Smart Hospital in 20 minutes. LEARN MORE. through Wednesday, Aug. 31—Late registration for fall semester. Monday, Sept. 5—Labor Day holiday. No classes. 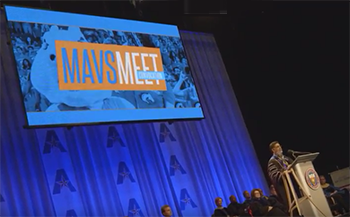 Thousands of former and current Mavericks attended the fall 2016 MavsMeet Convocation and AfterParty at College Park Center to kick off the new school year at UTA. Watch the video.